Today is the birthday of silent comedy ensemble comedian James T. Kelley (sometimes billed as James Kelly or Jim Kelly (1854-1933). Born in Castlebar, Ireland, he was said to have originally been a stage actor and singer, and judging by his 1897 Edison film credits, Bowery Waltz (Apache Dance) and Charity Ball, also a dancer. He is in one Universal short The Battle of the Nations (1914) with Louise Fazenda, Billy Franey and Gale Henry, and then most fortuitously went over to Esssanay, where Hal Roach put him in a couple of shorts, which got him quickly noticed, then employed by Charlie Chaplin, who made him a valued part of his stock company for a time. 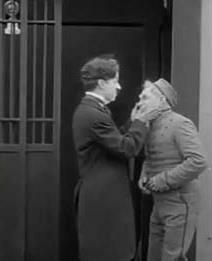 While still at Essanay, Chaplin put Kelley in A Night in the Show (1915) and Police (1916), and then put him in practically all of his Mutual shorts. It’s no mystery why. Chaplin’s company was built of types. Kelley was an older man, and extremely diminutive (not much above five feet tall, much smaller than Chaplin, who was quite short himself). Chaplin loved to put him in long white beards and then give him subservient positions like elevator operators and orderlies — and then abuse the hell out of the old guy. (Chaplin occasionally had a cruel streak). Kelley remained with Chaplin through A Dog’s Life (1918) and then jumped ship to Harold Lloyd staring with He Touched Me in 1919, remaining with Lloyd’s informal stock company through the feature Safety Last (1923), while also appearing in the occasional Francis Ford western. After his successive associations with the two top screen comedians, Kelley played the field, working with Baby Peggy in Hansel and Gretal (1923), Stan Laurel in Near Dublin (1924), Joe Murphy and Fay Tincher in Andy’s Stump Speech (1924), Edward Everett Horton and Zasu Pitts in The Business of Love (1925), Al St. John in Fire Away (1925), and Lloyd Hamilton in in Framed (1925) and Nobody’s Business (1926).